Take advantage of your pool project sites, and get the neighbors involved while you’re at it. It’s a big deal when someone gets a pool installed. There will be construction equipment, noise and people coming in and out of the backyard. 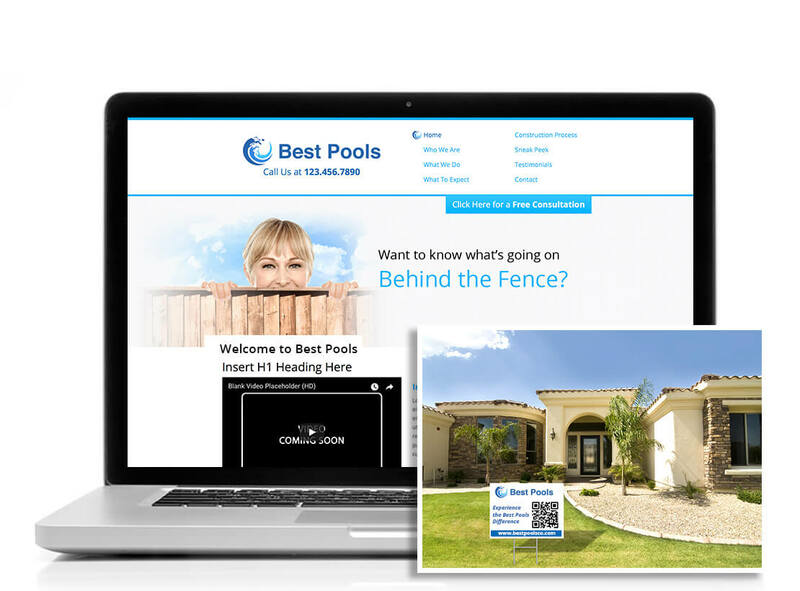 With our “Behind the Fence” website and yard sign, you can take advantage of advertising to the curious neighbors driving by as you are working on installing a pool. Our Behind the Fence Site with Yard Sign is advertising made easy. While your customers are having their pool built, they can place a yard sign in their front yard with a QR code that takes a visitor to a mini site with information about your company. You’ll also be able to discuss your construction process, teach them what to expect and provide a sneak peek of photos throughout the process. This can help generate interest and bring you more leads through the website. Easy to Use. Our desktop and mobile-friendly website works well for the digitally savvy consumer. Referrals Make Great Customers. Curious neighbors can, easily learn about the construction process and your business, giving them all the information they need to choose you as a pool builder. Promoted Yourself. Provide potential customers with information about your company, as well as what to expect during the pool building process. Our Behind the Fence Site with Yard Sign Package works best for any pool construction, service that wants to capitalize on “spreading the word” on your new customer’s pool project sites.